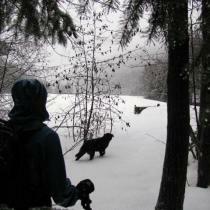 Sturgill's Landing takes you through a nice array of landscapes. A walk through the forest, beside a lake, and down to the oceanside. 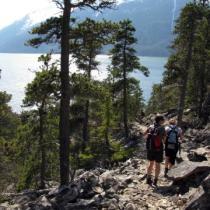 There are basic camping facilities at the end of the trail. 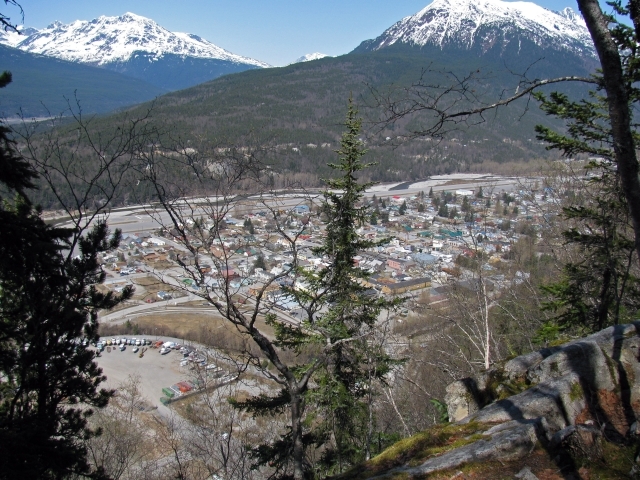 From downtown Skagway, go to 2nd Avenue and Spring Street. Walk over to the mountain side, over a bridge and across the railroad tracks. 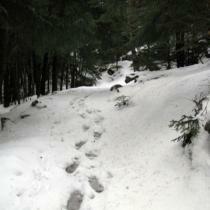 The trail starts climbing right away. The first section of the hike is the steepest, although it doesn't last long. Follow the wide trail and turn right when you see a sign indicating Dewey Lakes. Duck under the old pipes and continue along the trail. 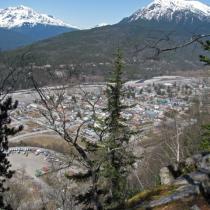 There is a nice viewpoint of Skagway while you climb along the side of the mountain. 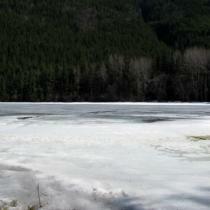 After you leave the mountain side, the trail follows alongside Lower Dewey Lake through the forest. 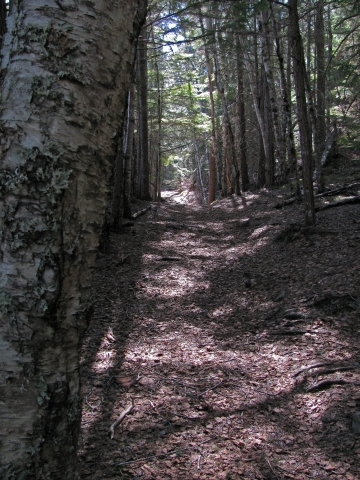 The trail continues through the forest, up and down, until you near the ocean. 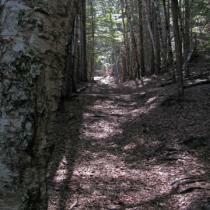 The trail turns rocky as you descend towards Sturgill's Landing. On a really wet day, the descent can be dangerous. On a nice day, it is no problem at all. Once down at the oceanside, there are some basic camping facilities like tent spots, fire rings, and an outhouse provided by the National Forest Service. 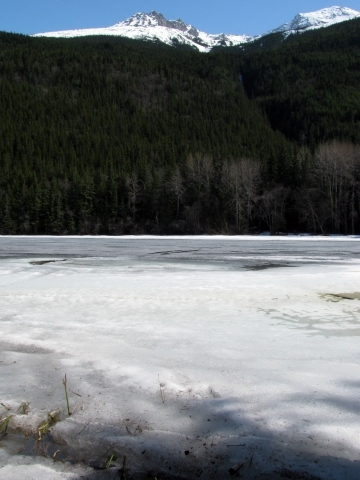 Coastal snow can be wet and heavy. 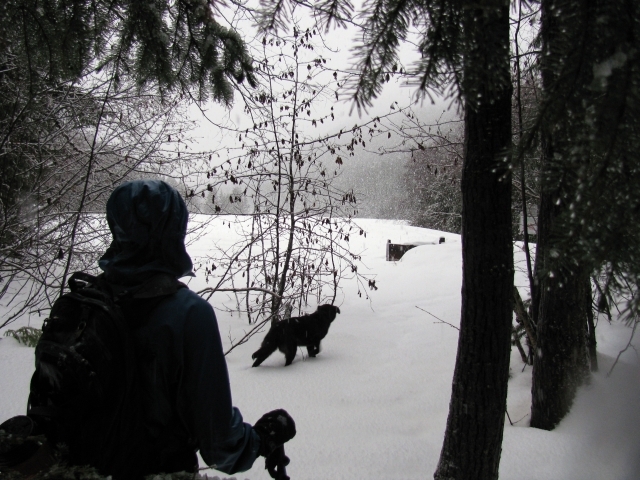 Wear snowshoes and be prepared to get wet. The descent down to Sturgill's Landing is not recommended if the rocks are wet. Have you been to Sturgill's Landing lately? 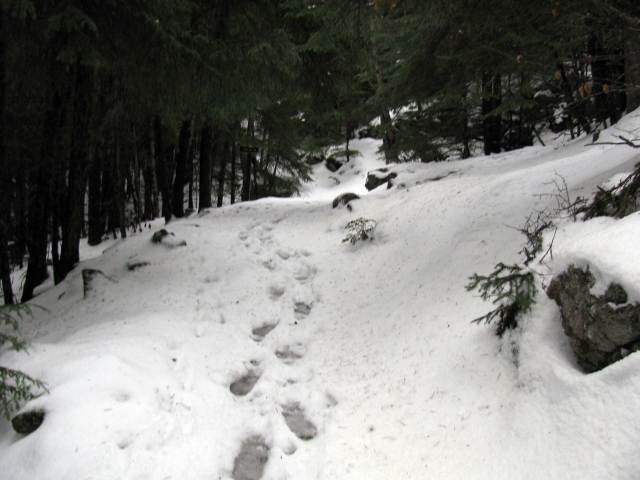 Though a little bit of snow, ice and mud, the trail is mostly clear. Lovely hike to the ocean. 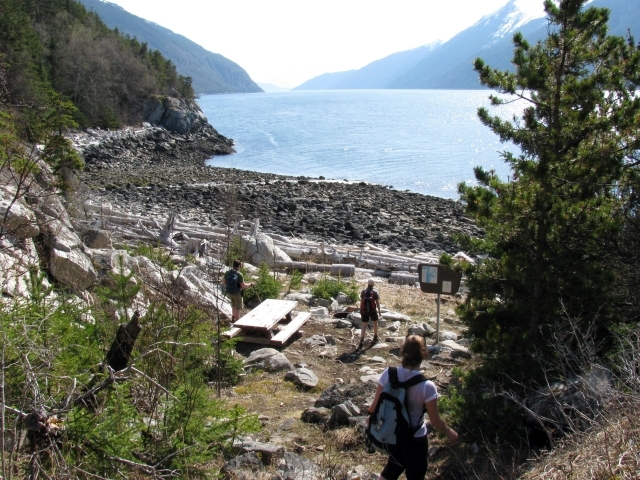 Has anyone hiked the sturgill's trail in skagway recently? 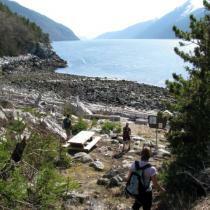 We are thinking about going to skagway this weekend to do this hike and have some thai food at starfire. 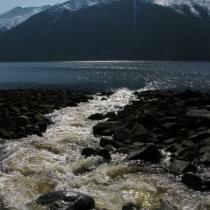 The hike into Sturgill's Landing this weekend was pleasant. It was hot and sunny at the beach, so we stayed for a few hours before hiking back. Beautiful hike. We stayed overnight April 30th, 2015. I wouldn't say it's an easy hike as per this website. 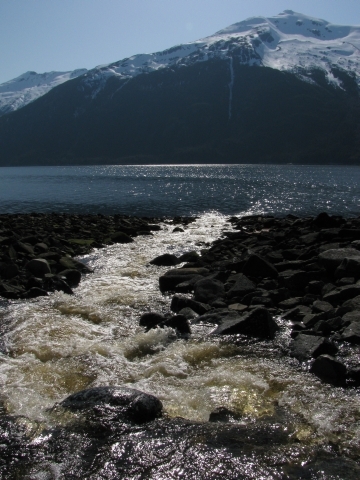 It has its pretty strenuous spots and many steep inclines with loose rocks. It was for sure more challenging with heavy packs on our backs. Took about 3 hours each way, with some hang out spots on the way. If the trail down to Sturgills landing is wet I could forsee definate challenges and potential hazards. Otherwise it's a beautiful location with stunning views. Small wood is very scare however if you bring a little hatchet, there is plenty of drift wood to chop up. 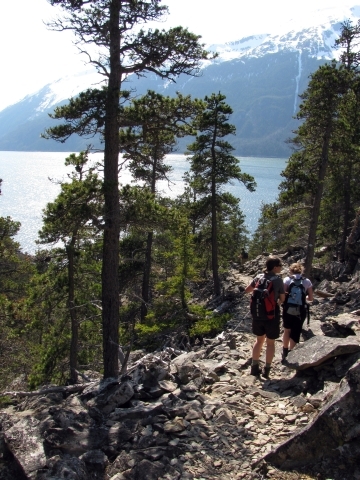 The Dewey Lakes trail system is open to mountain bikes. Some areas are also open to ATVs although I've never seen any up there. Use the service road rather than the Lower Dewey trail to climb up, it will be easier. (Coming down via Lower Dewey is more fun, of course). Once you get up it's pretty nice riding all around the lower trails. 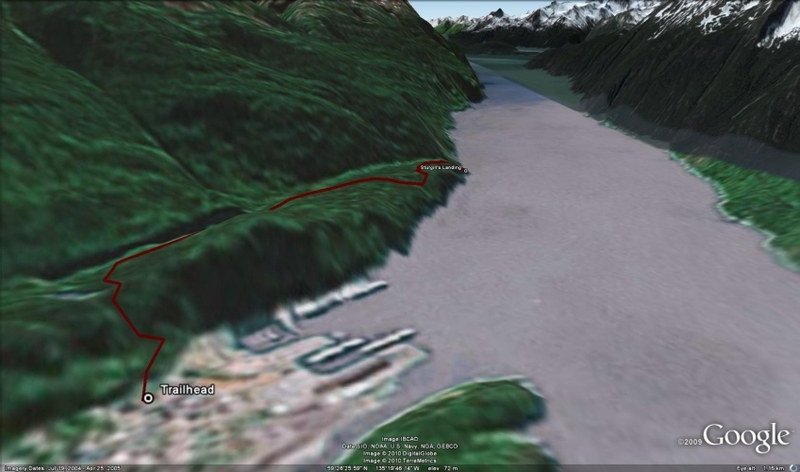 From what I remember the descent down to Sturgill's Landing might not be much good for a bike. But I've only been out there in the winter so it might not be too bad. Do you know if this could be mountain biked? The terrain would allow for it, but I don't know if riding is not allowed?? Did a quick overnighter at Sturgill's Landing on the weekend. We were treated to several displays by humpback whales swimming through the Lynn Channel. According to a local fella there's a resident pod of whales this year which is apparently unusual. Falling asleep to the sound of their blowholes releasing air was exceptional.